By: T. Berry Brazelton, M.D., and Joshua Sparrow, M.D. Although written several years ago by Dr. Brazelton and Dr. Sparrow for the Families Today column, the content of this article remains relevant today. Child abuse and neglect exist on a scale more massive than many of us realize. From 2001 to 2007, more than 10,000 children died from abuse and neglect, according to a new report released today by the nonprofit advocacy group, Every Child Matters. More than 20 million reports of child maltreatment have been made so far this decade to government agencies. In 2007, about 75 percent of children who died of abuse or neglect were 4 or younger. Almost half the deaths were among babies who had not yet reached their first birthday. The crisis in our health care system aggravates the threat. Children with special needs may be at higher risk, yet medical treatment for them is out of the reach of many families, adding another layer of stress. Mental health and substance misuse problems among parents are also risk factors for child abuse and neglect. Treatment, however, is often inaccessible or inadequately insured, and many families have no coverage at all. These factors can push vulnerable families to the brink. With access to quality care, families would get a healthier start. The U.S. child-abuse death rate is three times higher than Canada and 11 times higher than Italy. Why? These countries invest more per capita in families. Affordable child care, universal health Insurance, paid parental leave and visiting-nurse programs address many risk factors for child maltreatment. These countries’ rates for teen pregnancy, violent crime, imprisonment and poverty are much lower than the United States, which, by comparison, invests modestly in preventive measures. Many states’ resources are stretched thin. Some states spend as much as 12 times per capita more than others. In 2007, the child abuse and neglect fatality rate in the most dangerous state for children was 16 times that of the safest state. The recession has already weakened under-funded child protection systems. Differences among the states can translate directly into whether children live or die. States that spend more are likelier to investigate a higher proportion of abuse and neglect reports because social workers have more manageable caseloads. Children fall through the cracks when social workers have too many families under their care. In some districts, a social worker may be responsible for 60 or more families, though national standards recommend 12 or fewer per worker. Child protection work is difficult and emotionally draining. Child protection workers must often make harrowing decisions – like leaving a child in harm’s way or terminating parental custody. The preventable deaths of children demand the attention of policy makers and elected officials. While direct responsibility remains with local and state child protection agencies, law enforcement and courts, the challenge is national. Local efforts must be strengthened by expanded federal planning, coordination and funding. Federal funding provides nearly half the needs of the child welfare system, and much of the legal framework. The federal government is required to assess each state’s child protection performance and to recommend improvements, but neither federal funding nor oversight is at levels sufficient to protect all children. President Obama and the 111th Congress have shown strong interest in child well-being in their early policy and budget decisions. Now they must intensify federal involvement in what Every Child Matters calls “homeland insecurity” for thousands of our country’s most vulnerable citizens. Pressure on policy makers can start with parents, grandparents and other citizens who want to stop child abuse. Community leaders and legislators respond when they hear from constituents who speak up for those who don’t have a voice or who are too young or too frightened to speak for themselves. Dr. Brazelton heads the Brazelton Touchpoints Project, which promotes and supports community initiatives that are collaborative, strength-based, prevention-focused sources of support for families raising children in our increasingly stressful world. Dr. Sparrow, a child psychiatrist, is Director of Strategy, Planning and Program Development at the Brazelton Touchpoints Center. Learn more about the Center at www.touchpoints.org. Reprinted with permission from the authors. 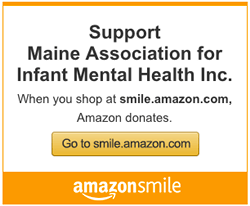 To directly support the Maine Association for Infant Mental Health please use the Donate button just below this message. Maine Association for Infant Mental Health updated their cover photo. IS A CHILD READY FOR TOILET TRAINING? From Baby to Big Kid, is an e-newsletter, from Zero to Three, that showcases how children learn and grow each month from birth to 3 years. Updated resources in the IMH field. What Does the ACE STUDY Mean for Maine Children?